This delightful 4 bedroom villa boasts an unbeatable location perched on the rocks, only 5 minutes walk from Kassiopi centre and beach. Neighbour to Villa Alexandros, Villa Angelos enjoys panoramic views over the sea and northern coast of the island. The main beach, harbour, restaurants, tavernas and shops in the town centre are all within easy reach making Villa Angelos ideal for anyone not wanting to hire a car. The villa also has a private heated pool, WiFi and air conditioned/heated bedrooms at no extra cost. The views from Villa Angelos are simply breath-taking. Plus Kassiopi isonly 5 minutes' walk away - a great choice! Outside a wide terrace surrounds three sides of the Corfiot villa and a fence separates it from its neighbour Villa Alexandros. The swimming pool is by the side of the villa and there is plenty of room to relax on your holiday and enjoy the Mediterranean sunshine or to sit in the shade. Villa Angelos is semi-detached with our Villa Alexandros, attached by a pergola belonging to the neighbouring villa. There are 2 entrances to this villa - one by the main door from the small track that leads around the headland at the back of the villa and the other through a gate at the side of the property and up some steps to the balcony. There is parking outside the gates or just inside on a communal driveway shared by the 2 houses. This villa has an open plan lounge, dining area and kitchen, with patio doors opening up onto a shaded balcony which encompasses the whole villa. The views from this balcony are breathtaking. There is also a WC. On the first floor there is a small hall off which is a double bedroom to the back of the villa with patio doors onto a small private balcony as well as onto a larger balcony that extends around the side and front of the villa, boasting spectacular sea views. There is also a twin bedroom with sliding patio doors onto this same front balcony and to the left of the stairwell is a separate bathroom. The stairs continue to the rooftop rooms in the eaves. Here is a double bedroom with windows to the front of the villa and a twin bedroom with windows to the side and front of the villa, plus an en suite shower room. There is also a separate shower room to the back of Villa Angelos. This villa is registered and licenced by EOT Greek licensing association. This number is: 300010829K122K80. On the headland linking Kassiopi Harbour with its main beach are our Villas Alexandros and Angelos. Only 5 minutes' walk from the beach and central harbour, Villa Angelos is in a great position. The harbour is overlooked by a number of traditional tavernas and quaint souvenir shops, as well as a couple of convenient mini markets. Positioned on the headland linking Kassiopi Harbour with its main beach are the neighbouring villas of Alexandros and Angelos. 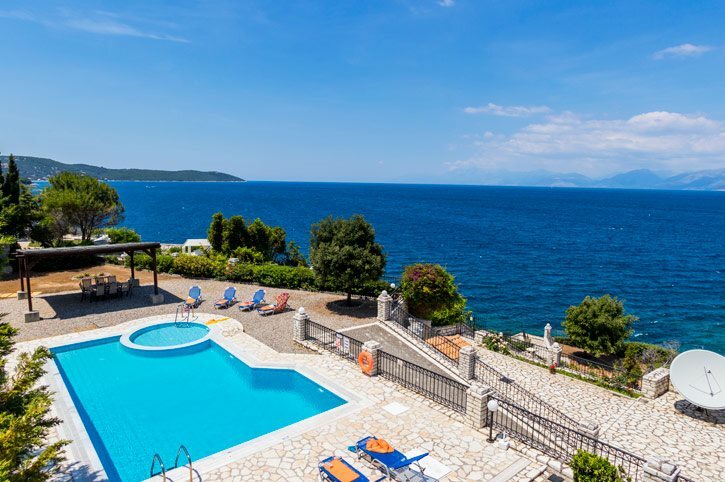 This villa is about 5 minutes' walk from the harbour of Kassiopi, with its vibrant selection of restaurants, cafes, shops and little fishing boats. Kassiopi's has a couple of lovely little pebbly beaches. The main beach is the closest to the villa, only 5 minutes' walk away. For anyone who does hire a car, there are a couple of waterparks on the island which make a great family day out! For anyone who does hire a car, any of the resorts along this north east coastline are well worth seeing. Corfu Town in particular is worth a mention. Around an hours' drive south, the journey is well worth it. The town is full of both mainstream and small boutique shops, quaint restaurants and cocktail bars. You can also visit the old or new fort, or admire the beautiful sunset over the water. Corfu Golf Club is around an hours' drive away, back towards Corfu Town. Villa Angelos is not available to book for season as it is sold out. Take a look here at the Corfu villas that are currently on sale. Paleokastritsa is commonly thought to be one of the most beautiful parts of Corfu. The main road leading into the resort is dotted with a choice of good tavernas, many with superb views over the rolling hills to the seafront. The resort also has a choice of excellent sandy beaches. Some of the smaller hidden beaches can only be accessed by boat, which you can hire to explore this area of coastline, or catch the water taxi. The area is popular with families, with a number of attractions. Aside from the beaches and stunning scenery, you can visit the blue water caves, hire a pedalo or even visit the local reptile house! Absolutely amazing villa. We will definitely be going back.